Teen Amateur Of The Week: For The Love Of Bodybuilding! He turned his passion into hypertrophy, worked his way onto the competition stage, and has big-time bodybuilding aspirations! See how Kai Greene serves as Matt's inspiration! I started out at as a hockey player from age 7-18. During that time, I began weight training and I fell in love with the weights more than playing hockey. When I got to high school, I immediately saw the weight room as a place to gain an edge on the ice. I was 165 pounds at 5-foot-9 and I was scrawny. Over the next three years in high school I managed to gain 45 pounds. However, my legs became too big and they started to cramp every time I played hockey. It was time to quit hockey and pursue bodybuilding after my senior year in high school. After high school, when I was able to eat more than regular, I was able to gain another 20 pounds of muscle, putting me around 230 pounds at 19-years old. In 2012, my sights were set on the 2012 Garden State Classic NPC show. I placed first in teens and seond in men's novice light heavyweight. At the show, my weight was at around 193 at 4.8 percent body fat. My hopes are to place high in the men's open division this August at the New Jersey State Championships with the help of my trainer, Cameron Gardner, from East/West Strength. I was out of shape coming into my first competition and I lost three percent body fat and eight pounds of lean muscle in four weeks with his help. The sky is the limit with his guidance along the way. Chest/Triceps - I try to concentrate on each part of the muscle, especially with chest. A lot of people neglect the lower part of the pectoral muscle as well as over train the belly of the muscle with flat bench, flat flys, etc. Back/Biceps - At this moment, I'm focusing on opening my lats up and creating more width as well as depth. I think a lot of teens have underdeveloped legs and back, so those two body parts require careful attention. Legs - Legs are probably the most important to me because I think a lot of competitions are won from the waist down. Most guys who compete always have the big pair of arms, or the big shoulders, but a lot of guys lack leg development, especially hamstrings. A good pair of hamstrings can win a competition and also put a teen like me ahead of someone who is much older and has trained a lot longer. Shoulders - I try to focus mainly on rear deltoids when I do shoulders. I hit my front delts pretty hard during chest and back days. I have overdeveloped front delts that aren't in proportion with the back delts, so I am trying to bring this lagging part up at the moment, as you will see with my regimen. This is my diet plan on training days (Monday, Tuesday, Thursday, and Friday). My nutrition stays close to this on non-training days, but I usually subtract a meal in the evening. The supplements that gave me an edge were Species Nutrition supplements. When I'm looking for supplements, I look for purity and I look for labels that don't have a laundry list of chemicals, additives, etc. Species tries to simplify nutritional supplements and I really enjoy their Isolyze Protein because of the taste and the lack of unneeded ingredients. The Species Macadamia Nut Oil should be mentioned because of its highly effective uses for cooking for bodybuilding purposes. This is my supplement plan on training days (Monday, Tuesday, Thursday, and Friday). I use mostly the same supplements on non-training days, also. My passion for bodybuilding started when I was a little kid in the gym. I was about 12-to-13-years old just going through the motions until I saw this one guy, his name was Carlos. I never spoke to him, but god, was he enormous! From then on, I wanted to be like him, so I trained like him, and I trained hard. I have new people I try to be like (Kai Greene, Dennis Wolf, Evan Centopani), but the passion of wanting to be better is still there like it was when I was little. I think the best part of bodybuilding is that nothing is ever perfect. I think bodybuilding is filled with perfectionists who are just always trying to bring a better and better package. They always have work to do. Phil Heath is the best bodybuilder in the world, but he is still training because he knows he is not perfect and he can do better. My trainer, Cameron Gardner, is a huge help to me. He was a bobsledder, power lifter and a bodybuilder, so he has a lot of knowledge about strength as well as building muscle. I learn new things from him every day that help me move forward as a bodybuilder and as someone who is interested in the field of fitness. Kai Greene Cardio Confessions or any Kai Greene video for that matter. Kai, although eccentric, is probably the most passionate about the sport of bodybuilding. He loves it so much that I guess his love for the sport motivates me to do better myself. Obviously, my girlfriend Amy has been a supporter of mine along the years, and she is the one who does my coats and coats (and coats!) of tan before shows. She is a big support system for me. My future plans at this moment are to compete in the Men's Open event at the New Jersey State Championships on August 25 in Union, New Jersey. Then I'll probably take off for a while and get my muscles more mature until I am able to compete at a higher level. The most important tip I can give anyone is to work on the body parts that no one notices. 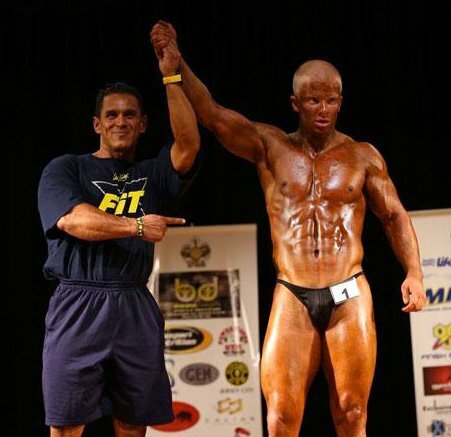 As a bodybuilder, the ones that no one notices when you are at the beach or in a nightclub are the ones that judges base their decisions on when you're on stage. Kai Greene without a doubt. I will go on a limb here and say he loves the sport of bodybuilding more than anyone else in the world. He lived in poverty when he was trying to become a top professional and it was merely because of the fact that his passion was so strong he could never do something that wasn't his passion and I think that is the way everyone should try to lead their lives, but only a few are brave enough to do it. Bodybuilding.com has been a reference for me since I was 13 years old. Sometimes I would get these workout plans and have no idea what they were. Bodybuilding.com had all the pictures and even videos up so that I could check and see if I was even doing them right. As I got older, I could type any question in, and chances are it was answered on Bodybuilding.com. There are a lot of knowledgeable people on this website and I was one of the lucky ones to utilize them. If anyone has any questions at all please email me or message me on my BodySpace account. I'm more than willing to try to help in any way I can or point you in the direction you're looking to go.